Taped in England in the late ’80’s, Brutal Bertil tells it like it is. Fox was one of the most outspoken, popular, smart, down-to-earth physique stars in the professional ranks. Taped in England in the late ’80’s, Brutal Bertil tells it like it is. Fox is one of the most outspoken, popular, smart, down-to-earth physique stars in the professional ranks. He speaks his mind on all subjects from his feelings towards judges, and his fellow competitors, to training and steroids. This is a controversial seminar – nothing is held back! Naturally Bertil poses his brutal physique but that’s not all. Bertil also does some very heavy bench pressing on stage, and explains style and form. 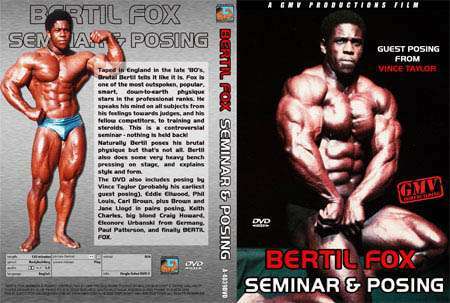 The tape also includes posing by Vince Taylor (probably his earliest guest posing), Eddy Ellwood, Phil Louis, Carl Brown, plus Brown and Jane Lloyd in pairs posing, Keith Charles, big blond Craig Howard, Eleonore Urbanski from Germany, Paul Patterson, and finally BERTIL FOX.